These basil tomato biscuits are delicious crackers for enjoying a good time. The brand Grillon d'Or was born in 1991. From the beginning, it is intended to provide quality products while respecting the environment. The brand offers over 70 different recipes of cereal for breakfast Grillon d'Or. The brand is a point of honor to produce organic cereals without harming the environment . It is for this reason that the company has built an extension in eco-construction. Because organic produce is good, but in the greenest way possible, it's even better ! In 2009, the company was also awarded the Academy Award for Sustainable Development for its overall ecological approach . Grillon d'Or develops, in addition , a policy of closeness and solidarity with producers. 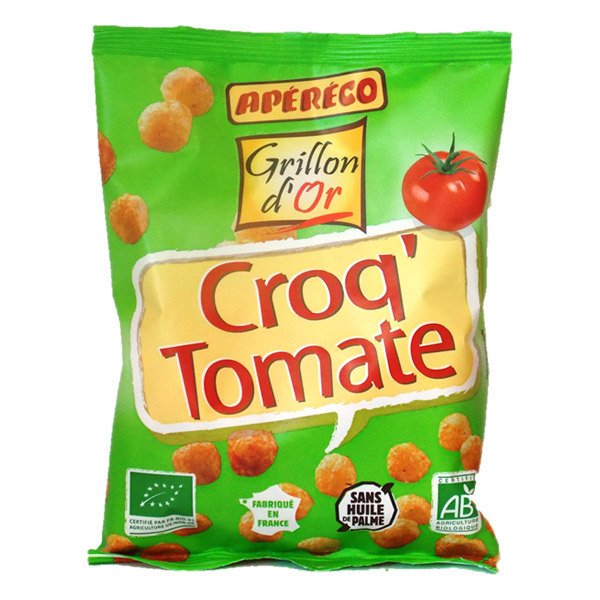 The brand works with local producers of organic grains, and participates the development of French organic agriculture. Grillon d'Or also likes to avoid overpacking : blister pack is preferred. For these labels, Grillon d'Or is working with local printers, Imprim'Vert certified , using vegetable inks and helps to recycle waste labels.